This week Nikolai's school is having performance level evaluation tests, (known by various acronyms depending on location) so it is a busy week. Nikolai is quite confident he will do well, and I am also. I have always been fascinated with basket weave from tiny examples to hot-air balloon basket size. I also save those Easter treat boxes as some of them are cute and can be recycled to be used as treat boxes anytime. Here I used one to hold a bunny treat. 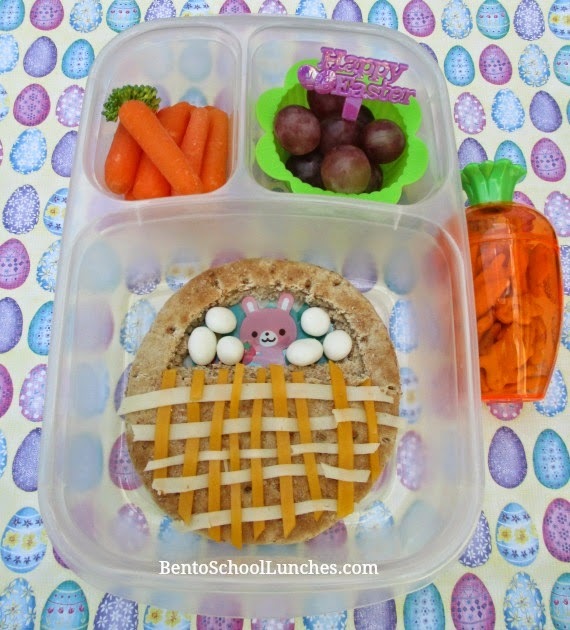 Basket sandwich freehand cut from round sandwich thins decorated with weave of mild cheddar and Provolone cheese with yogurt covered raisins and bunny baran sheet. Organic baby carrots- one with broccoli top. Seedless red grapes in silicon cup with Easter pick. Along side is a carrot shaped treat container with Annie's organic cheddar bunnies. Love that basket weave sandwich! Very creative! I love ur basket, very nice! N I love the treat box too.